MANILA, Philippines – The complete list of passers of the Philippine Science High School National Competitive Exam (NCE) for academic year AY 2016-2017 are officially released online on Sunday, December 13, 2015. 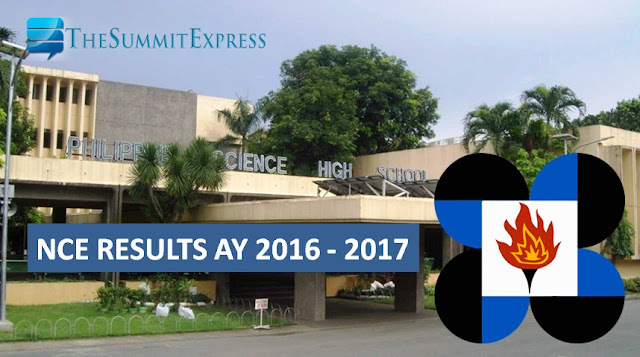 The 2016 NCE was administered by the Department of Science and Technology (DOST) to 22,760 total number of examinees on Saturday, October 3, 2015 in several testing centers nationwide. The Secretary of DOST and Chair of the PSHS System Board of Trustees announced the names of the successful qualifiers to the Philippine Science High School System (PSHSS) Search for Scholars for 2016. PSHS official Facebook page announced that NCE results are usually being released every December. It will be published in a major newspaper and on their official website. For the 2015 NCE, results were out online on December 20, 2014. Of the 23,660 applicants, 1,303 examinees successfully hurdled the one-step screening that was administered on October 2014. December 12, 2015 Update: The complete list of passers of PSHS System NCE for academic year 2016-2017 will be published online either late today or tomorrow, December 13. Please standby for the results. December 13, Update: NCE results out online today. The PSHSS is a specialized public high school system in the Philippines that operates as an attached agency of the DOST. It is considered as the top high school in the country and is viewed to be one of the best in the ASEAN region by 2016.